I have a confession, I like to enter sweepstakes. I love winning things… especially when it’s a fun and easy sweepstakes with great odds! It is a fun way to spend a little time every day, and it really isn’t a waste of my time, because I can win things. Things I need and want. A while back I signed up with ShopYourWay, where I have been enjoying their Win Your Way portal. It’s exactly as the name implies — you can win YOUR way. You must be a member of ShopYourWay (which is free), then when you enter a sweepstake you can earn points. The points are equal to a dollar amount. For example, one of the sweepstakes I entered was the “What’s for Lunch Sweepstakes”, because I was planning my son’s lunch menu for the week, it was a fitting sweepstakes. All I had to do was “like” 10 food items. I liked 10 items that my son would eat for lunch and “bam” I was entered for 10,000 points. By the way, 10,000 points equals $10. Another great thing is that it shows you your odds of winning, by showing you how many entries. There were 195 entries in the What’s for Lunch Sweepstakes, so I had a 1:195 chance of winning. Not bad odds at all. I didn’t happen to win this sweepstakes, but I’m feeling lucky about my next one. If you don’t want points, you can win merchandise and trips, digital awards and products in some sweepstakes. As you can see from a small example of sweepstakes in the image above, there are some really great sweepstakes to choose from. I’m entering to win the new electric range next. I really need one. And before I go out and buy one, why not win it! Right? Some of the contests/sweepstakes have different ways of entering, but they are all easy. Seriously, easy. Remember, it’s free to sign up at ShopYourWay, and you have as much of a chance of winning as anyone else. But you can’t win… if you don’t enter! After you sign up, you also earn points when you shop online or in-store, as well as save money on future purchases. Disclosure: This is a sponsored post with Brandfluential, I am a Win Your Way blogger, though all opinions are my own. This is one of the things I gave up when I started to not have enough time, but I miss entering giveaways. I know what you mean about time. 🙂 I take a little time each week entering, because it really is quick and easy with #WinYourWay! 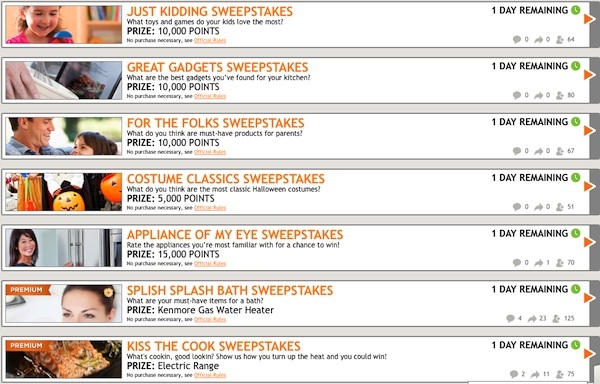 This looks like a fun site, I love entering sweepstakes. There are so many hoops though.